From November 3 to December 31, use the Shazam App to enter the Corona Holiday Sweepstakes 2017 and you could win a trip for 4 to Tulum, Mexico including a stay in a luxury villa. Plus, you could win weekly $250 gift codes redeemable for merchandise at The Corona Store. Scan the image of the Corona Extra or Corona Light bottle shown on the special Sweepstakes displays at participating retailers. Scan the special Shazam logo shown on the special Sweepstakes displays at participating retailers. Scan the song played during the Corona’s Feliz Navidad holiday-themed television commercial. Scan an actual Corona Extra or Corona Light bottle or any image of a Corona Extra or Corona Light bottle. You will be redirected to the Corona Holiday 2017 Sweepstakes Website. Follow the instructions to complete the Sweepstakes Registration Form and submit your entry into the Sweepstakes. Limit one Entry per person/email address per Entry Period. Who Can Enter? The Corona Holiday Sweepstakes is open only to legal residents of the fifty (50) United States and the District of Columbia, who are 21 years of age or older as of date of entry. When To Enter? The Sweepstakes Period begins at 12:00 AM ET on November 3, 2017 and ends at 11:59 PM ET on December 31, 2017. How Sweepstakes Winners Are Chosen? The Grand Prize winner will be randomly selected by Administrator, on or about January 3, 2018, from among all eligible Entries received throughout the Promotion Period. What Are The Sweepstakes Prizes? 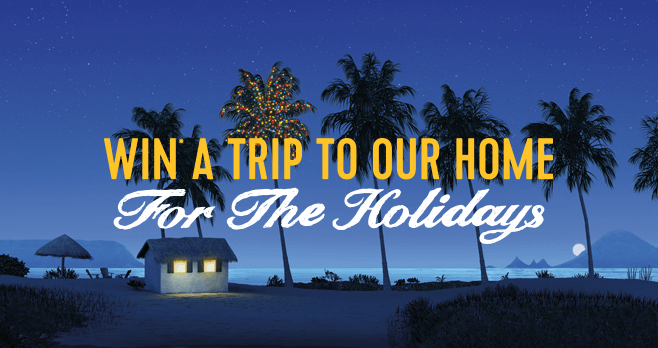 The Grand Prize consists of a 6-day/5-night trip for four to Tulum, Mexico. Who Are The Winners? For the names of winners, send a stamped, self-addressed envelope by March 1, 2018, to: Corona Holiday 2017 Sweepstakes Winners, Dept. VZ, 100 Marcus Drive, Melville, NY 11747.